Flights were affected and some schools closed on Wednesday due to snow and ice in parts of Northern Ireland. There were delays and cancellations at both Belfast airports and up to 9cm of snow was reported in some places. Overnight snow showers fell mainly in the north and west causing travel disruption. A Met Office warning for ice is in place from 17:00 GMT on Wednesday until 11:00 on Thursday. City of Derry Airport has reopened after being closed on Wednesday morning, while some Foyle Metro services, which were suspended because of the weather, have since been reinstated. All driving tests on Wednesday were postponed at test centres in Enniskillen, Cookstown, Newbuildings and Omagh because of the weather, the Department for Infrastructure said. The Forest Drive at Slieve Gullion, which closed on Tuesday, also closed on Wednesday due to icy conditions. Several official weather stations recorded the snowfall accumulations. 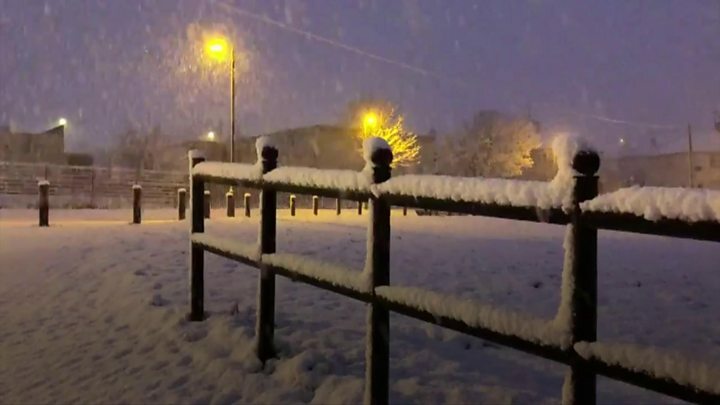 Thomastown in County Fermanagh registered 9cm of snow overnight, while Ballypatrick Forest in County Antrim had 7cm of snow. Lough Fea in County Tyrone saw 4cm of snow, while Castlederg, also in County Tyrone, registered 1cm. It's the coldest night of winter, so far. Temperatures fell to -6.3C in Katesbridge, County Down, at 22:00GMT. The hamlet often records the lowest winter temperatures as it is a hollow where cold air sinks. Temperatures are expected to fall further during the night. It was closely followed by Magilligan Point in County Derry where temperatures have fallen to -4.5C. Derrylin in County Fermanagh recorded -4.3C at the same time, while Lough Fea in County Tyrone registered a low of -4C. @barrabest @newslineweather @WeatherCee @angie_weather . The Department for Infrastructure has a handy mapping tool showing updates on what roads are gritted. In the Republic of Ireland, Met Éireann has issued a status yellow snow-ice weather alert for Ireland which is valid until midday Saturday 2 February. You can get more information on travel across Northern Ireland on Twitter on the BBCNI Travel page . Has your travel been affected by the snow? Tell us by emailing haveyoursay@bbc.co.uk.